In an early celebration of Valentine's Day, my husband and I had a date night on Sunday night. 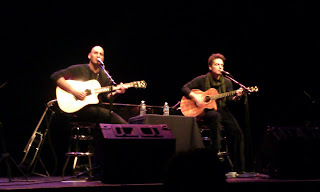 We headed into Cleveland to the Ohio Theater at Playhouse Square and watched an acoustic performance by Richard Marx and Matt Scannell. It is part of their Duo tour. Music was part of our initial connection, so it only seems appropriate that we would celebrate love with a concert experience. One of our friends was kind enough to pick up the tickets for us (they were supposed to have joined us, but in the end had a conflict that prevented them from joining us). We were excited that we had tickets in Row A. Row A, suggests front row, right? Well, once we got to the show, we learned that Row A is actually the third row - there were two rows of folding chairs, Rows XA and XB. Either way, they were still great seats. The show was nice and casual. They told stories, bantered back and forth and played their music. Sitting in the near front row made the already intimate concert feel even more intimate, like we were sitting in a room with them, just catching up and playing music. Hearing Richard Marx talk about his three boys when he talked about writing Angelia back in the day of his poofy mullet, really provided an interesting perspective. Suddenly, it was Richard Marx, the man, the dad - not just Richard Marx song-writer, producer, singer, etc. I think the fact that we were sitting so close even made it feel more so that way. It was a nice mix of Richard Marx, Vertical Horizon and Richard Marx/Matt Scannell songs. 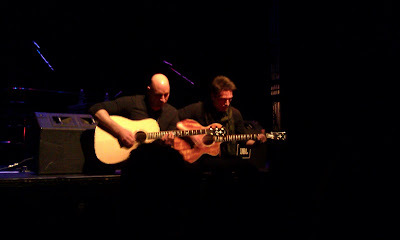 At one point, they unplugged and sat down on the front of the stage and played and sang without any amps or microphones. It was a really good show. I'm always glad to get a date night out (or in) with my husband. When we have the opportunity to have such a memorable experience, it makes it even a little more special. I was at the Richard Marx/Matt Scannell show, too. I had a great time! Both are very talented.